Unsaturated fats are often regarded as healthier than their saturated equivalents. This translates into eating fish rather than beef burgers, chicken rather than pork and olive oil rather than butter or lard. These sorts of dietary changes have calorific advantages for those wishing to reduce their dietary intake of energy, as unsaturated fats contain slightly less energy than saturated fats. Unsaturated fats are often described as having a number of health benefits, including reports in the popular press that they may ease type II diabetes and reduce heart disease. Although much of this evidence is not yet conclusive for the general population – with anecdotes about some sources of saturated fat sounding counter-intuitive at first sight – we do know a lot about the basic chemistry of unsaturated fat. Anyone who has cooked with unsaturated fat (cooking oil) and left it exposed to the air for a period afterwards will be aware that the fat will become rancid – it rancidifies. Rancidification is a reaction between the unsaturated bonds in the oil and oxygen from the air; the unsaturated bonds are oxidised. This is what makes the flavour and smell of the fat much less attractive. Unfortunately, this sensitivity to oxidation is inherent in unsaturated fats. In fact, the more unsaturated, the easier it is for them to rancidify. A further problem is that such fats do not need to be exposed to the air for oxidation to occur. Oxidation can also happen to fats in our bodies. Oxidation of fats in our cells happens much more slowly than in air, and happens when the fatty acid residues are attacked by oxygen radicals. This phenomenon relating to the fatty acid residues in lipids in the eye has been discussed in this blog already, but there is mounting evidence that suggests oxidation of fatty acids and the metabolic products are important for normal metabolic function, but are also important in dysfunctional systems, including in the brain , in atherosclerosis  and in tissue repair . If such a process is so widespread and influential, you may wonder why it has taken so long to come to light. The good news is that most life forms have evolved to be able to metabolise the oxidised fatty acids, removing them from the system. Recent research by Teixeira et al.,  suggests that one method involves dietary intake of a specialised kind of fatty acid. This fatty acid contains what is called a furan ring (a five-membered ring comprising one oxygen atom, Fig. 1), but is otherwise not unusual. 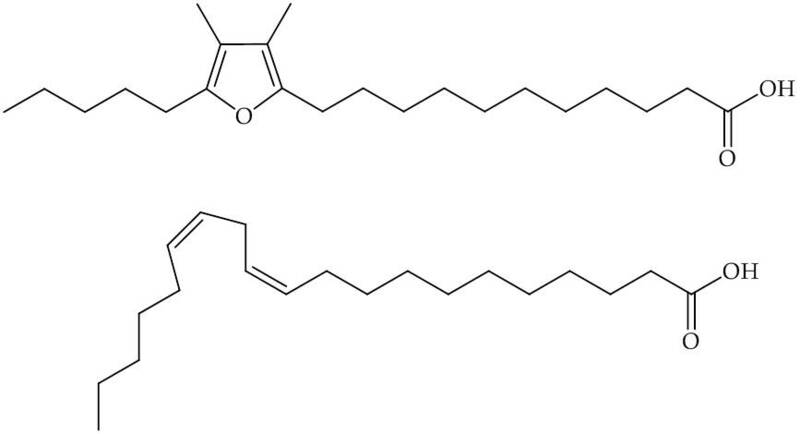 Fig.1, Top, Furan-containing fatty acid, known as F6; Bottom, eicosodienoic acid, an unmodified fatty acid that may be a precursor to F6. Evidence from this study  suggests that once this modified fatty acid is in membranes, it is able to react with damaging oxygen species in the place of other fatty acids. This greater reactivity of the F6 is ascribed to its ability to ‘scavenge’ for the reactive oxygen species that would otherwise react with unsaturated fatty acids. This mechanism is based on a replaceable molecule that suffers oxidative damage more readily than ordinary fatty acids. It therefore protects the others by acting as a sort of ‘fall guy’. How this mechanism operates allows us to draw a number of conclusions and ideas for future work. First, modified fatty acids such as F6 are present in fish oils and so dietary intake of seafood seems a good way of improving the availability of such molecular species. Second, an idea arising from the mechanism described by Teixeira et al.,  is that it may be possible to prevent or reduce oxidation using chemical intervention. In other words, using this mechanism as a basis, it may be possible to develop treatments for conditions that result from oxidative stress. This has implications for how conditions such as Alzheimer’s and cardiovascular disease may be overcome. A. Teixeira, R. C. Cox, M. R. Egmond, Food and Function, 2013, in press, DOI: 10.1039/c3fo60094g.